Legendary, enormous database compiled by Dr. Jim Duke. Good site to learn about flower essences, what they are, and how they work. 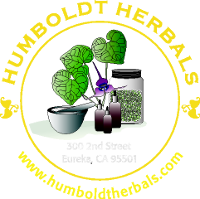 We stock almost all of their products at Humboldt Herbals. Comprehensive resource of herbal FAQ’s, herbal text books, articles, plant images and botany. Created by Henriette Kress. Huge collection of historic and current books, journals, and archival materials on a wide variety of disciplines within the subjects of natural history, botany, pharmacy, medicine and scientific history. The late Michael Moore’s website – what an incredible catalog of work this gentle man produced over his lifetime! This site is a rich herbal resource with plant images, manuals, detailed materia medica, classic herbal texts, journals, and more and more. You could spend a lifetime reading the offerings on this website! Dedicated to protecting and saving native medicinal plants of the United States and Canada. Access current at-risk plant lists, and sign up for free seed and plant giveaways. A searchable index of hundreds of health conditions with herbal treatment recommendations. Many of the herbalists listed below are available for private consultations. Please refer to their individual web sites for more details. Directed by herbalists Kiva Rose & Jesse Wolf Hardin, who are also the founders of the Traditions In Western Herbalism Conference – our favorite annual herbal gathering. Their school is located in New Mexico’s pristine Gila National Forest – one of the “wildest and most magical mountain ecosystems in the world.” Learning opportunities at Animá include home study courses, wilderness retreats and on-site classes, plus a free articles archive and outstanding blog. Directed by herbalist Phyllis Light in Arab, Alabama. Three levels of study are offered, in increasing detail, about traditional Southern and Appalachian healing techniques as well as North American and Western herbal ways. Herbalist, author & raw food chef. Lots of articles and great recipes from this 35 year practitioner of natural medicine. Offering long-term, short-term and weekend classes across a wide range of herbal topics. Directed by herbalist Jane Bothwell in Arcata/Kneeland, California. Dedicated to furthering and preserving herbal traditions and teaching ecological ways to cohabit the world. Enjoy recipes, slideshows, and information about current classes and field trips. Herbalist and author with almost 40 years of training, offering workshops, books, articles, and free downloads of botanical medicine classic texts. Naturalist, herbalist and storyteller. A blog, videos, stories, books, cds and dvds from this living American treasure. Directed by herbalists, authors and acupuncturists Michael and Lesley Tierra. Great articles, blogs, and distance learning programs on Planetary Herbology – a unique combination of the three major healing traditions of the world. Directed by herbalist, artist and author Candis Cantin in the Sierra foothills outside Placerville, California. Correspondence and on-site courses, articles. With herbalist Kami McBride, author of one of our favorite books, “The Herbal Kitchen.” Her work is “ dedicated to reviving the art of home herbal care and nurturing awareness and empowerment for women in relation to their body cycles.” Enjoy articles, recipes, class schedules and a free newsletter. Matthew Wood and the School of Traditional Western Herbalism (http://www.matthewwoodherbs.com/index.html) Current class schedule, articles, photos, a blog, basic principles of traditional western herbalism, and more from a most important voice in contemporary western herbalism. Aromatherapist and herbalist Mindy Green’s site includes articles, interviews and an outstanding selection of aromatherapy links. Directed by herbalist Paul Bergner. Correspondence and certification courses, and excellent links for all things herbal. Directed by herbalist 7Song in Ithaca, New York. Current classes, copies of class handouts, articles, and really cool photos. Directed by herbalist Christa Sinadinos in Arcata/Fieldbrook, California. Find articles, recipes, herbal monographs, and info on upcoming classes and certification programs. Directed by medical aromatherapist Kurt Schnaubelt, PhD. Correspondence courses leading to international certification in aromatherapy. Directed by herbalist and author Pam Montgomery - located at the base of the Marble Mountains in Vermont. Classes and articles on herbal medicine, Plant Spirit Healing, and spiritual ecology. Correspondence courses, articles, ezine, apprenticeships, healing intensives, books, recipes and informative youtube videos from the teacher and elder of the Wise Woman Tradition. Guisepi, the tea time traveler, and Edna the Tea Bus travel up and down the west coast cultivating community and encouraging dialogue about peace, environment, and health through actions like serving free tea! “Stargazer Li brings the wisdom of the stars down to earth in away that is accessible, creative and simply brilliant.” We couldn’t agree more! Hear stories about the stars from throughout time and diverse cultures, try her planetary elixirs, and explore the passing days through her calendar journeys. A lovely way to start your day – makes a great “home” page. A multicultural world prayer archive. Links to all things Humboldt.